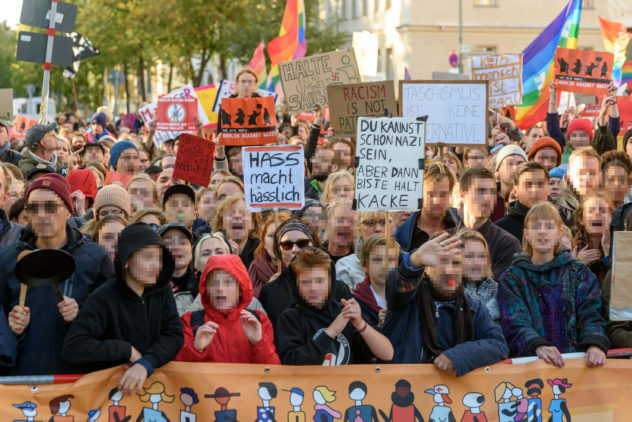 About 1,300 participants joined the right-wing extremist march organized by “Wir für Deutschland (WFD)” on October 3, 2018. 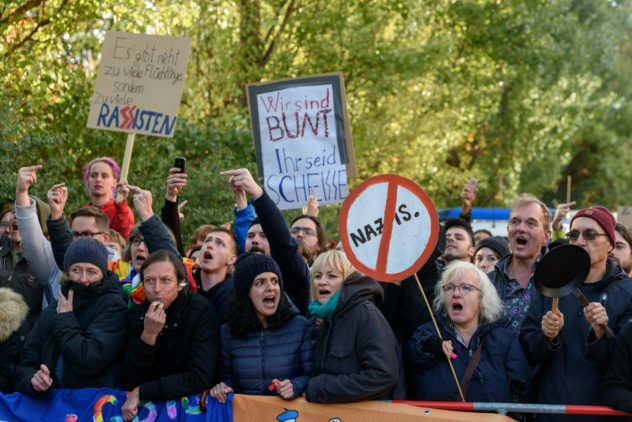 The local residents’ initiative “Anwohnerinitiative für Zivilcourage – Gegen Rechts” countered the march with a barnstorming program along the demonstration route through their neighborhood. A comprehensive programme with music and speeches by local organizations and initiatives drew and audience of more than 1,500 participants. 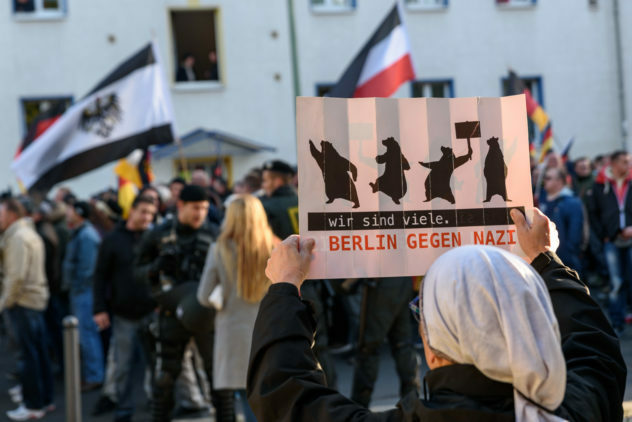 The right-wing extremists marched from Hauptbahnhof though the district of Spandauer Vorstadt and back carriying and chanting unmistakably racist slogans. “The longer the initiators have to wait for the exact route to be announced, the harder it gets to realize protest events within sight or earshot of the march.” This was “discouraging” for all participants. 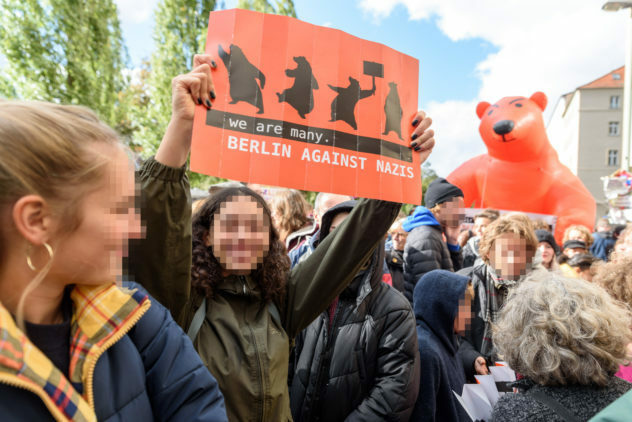 Within the remaining 48 hours between the announcement of the right-wing extremists’ marching route and the demonstration, Berlin against Nazis teamed up with partners and local organizations to inform all residents, who would be directly affected, with a mailbox information flyer campaign. 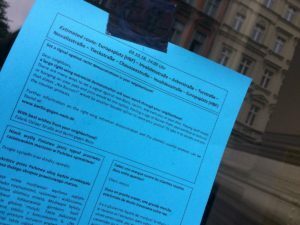 On October 3, the registered location of the protest event of the residents had to be relocated yet again due to an order of the officer in charge. Eventually, the event took place at Ackerstraße and Invalidenstraße. Bündnis für ein weltoffenes und tolerantes Berlin, a broad initiative of churches, trade unions, charities, and further actors of civil society supported the residents’ protests supplying stage and equipment for the musical program. Against all odds caused by wide-ranging barriers, random controls surrounding the right-wing extremists’ demonstration route, as well as far detours for all who intended to participate in the residents’ protests, about 1,500 people gathered at the event organized by Anwohnerinitiative für Zivilcourage – Gegen Rechts. The new location could barely contain all participants, which consisted especially of young people, children, and local families. Ben Becker reading Celan’s Death Fugue. Photo: Berlin against Nazis. 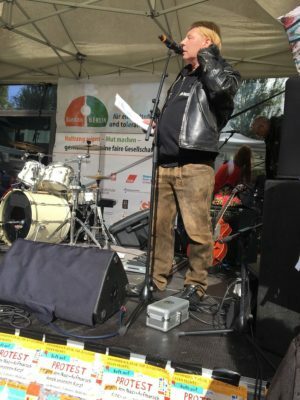 A comprehensive program begun consisting of speeches an music by members of the residents’ initiative, the local Protestant pastor, spokespersons of AWO and DGB-Mitte, as well as a representative of the political party Die Urbane. 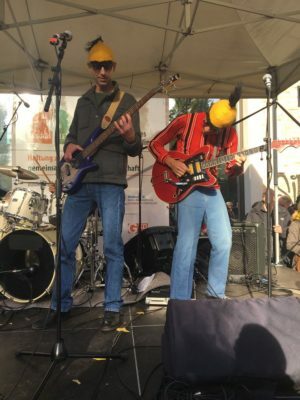 These contributons were complimented by a reading of Paul Celan’s Death Fugue by Ben Becker as well as by a very diverse musical program with gigs by Bobo in the White Wooden Houses, Bert´z Rache, Gigo Flow, Auge.Blau, and further acts. 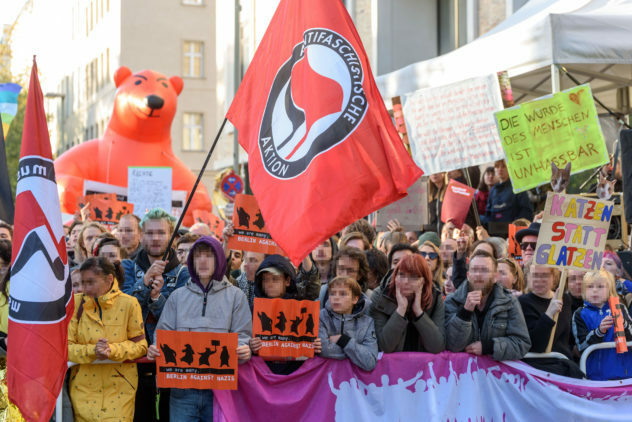 This set the mood and once the right-wing extremist march passed Ackerstraße, the protest swell to an ear-piercing level. 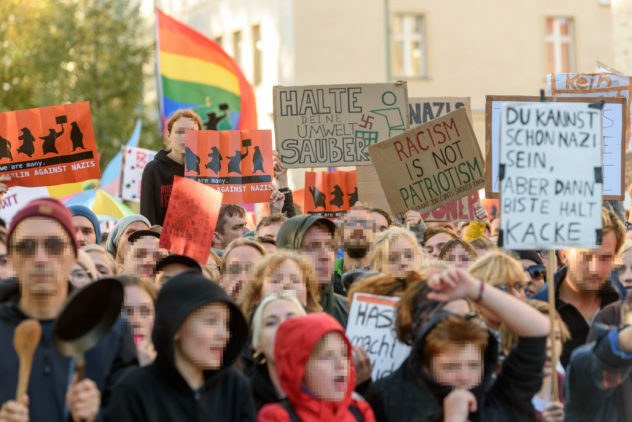 Many residential buildings in the neighborhood were hung with banners, and the protest were extended to the surrounding windows and balconies, which was answered with threats and harassments by the increasingly aggressive marching neo-Nazis. 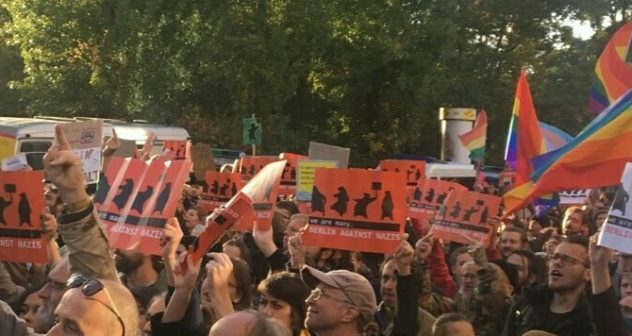 At noon, a further protest event started, which was organized by protagonists of the techno scene and Mitte residents under the slogan “Tanzversammlung Rosenthaler – Tanzen gegen Rechts” at Rosenthaler Platz. 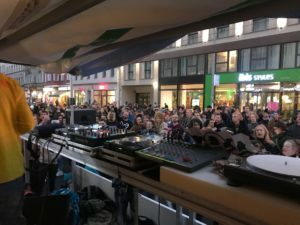 Several hundred people took the opportunity to counter the right-wing extremist march with the techno scene’s lust for life, which in the 1990s was based in Berlin’s Mitte district. Amongst others, Dr. Motte played a set.